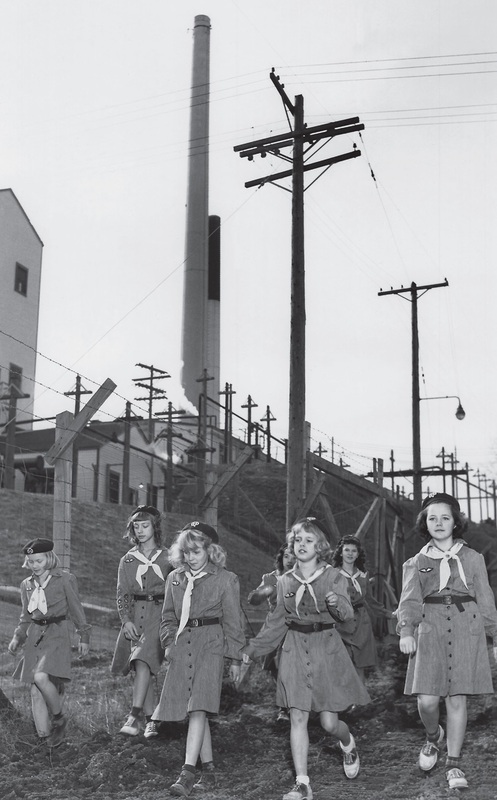 I joined the Brownies, the junior version of the Girl Scouts, because of a photograph I saw in the Oak Ridge Children’s Museum that irradiated my desire to be part of a gang of girls—a troop. The black-and-white snap, taken in 1951 by Oak Ridge’s official Manhattan Project photographer, Ed Westcott, showed young atomic citizens decked out in smart uniforms—berets, kerchiefs, buttons, patches, and belts—proud emblems and accessories of the bold, new American generation. Many wore the black-and-white oxfords that my mother called Mickey Mouse shoes. In 1963, the Boy Scouts of America issued their Atomic Energy merit badge; a patch with a red-and-blue atom stitched into a background the color of yellowcake.24 An equivalent badge was never issued for the Girl Scouts. No matter. The scouts of Oak Ridge hardly needed this patch. Their uniforms were already sewn with their town’s very own atom and its accompanying acorn. And what’s more, they lived and breathed atomic energy. They marched past the atomic factories just as they would walk past the local drugstore or ball field. For them, it was regular, everyday. Since my scouting affiliation was based in another town, I was never able to march with my compatriots past factories born for the Manhattan Project. Instead, I was taught how to sew a potholder that looked like an enormous grape. When I learned the new scout leader was the mother of a girl I did not like much—the two wore matching sweater sets in the pale, shimmery colors found inside oysters—I dropped out. Instead, I prowled around alone, a composite of Davy Crockett, Nancy Drew, and Natty Gann sporting a faux raccoon cap, worn brown corduroys, and a small, red backpack where I kept my compass and mystery novels written by Carolyn Keene. Never able to live up to the image that inspired me, I lost interest in scouting and grew more intrigued with nuclear spaces and spies. 24. Yellowcake, also called urania, is a type of uranium concentrate powder that has very low radioactivity. This is uranium in an intermediate stage in processing. Yellowcake is valuable because it can be converted into U-235, a more fissionable type of uranium, to be used in nuclear weapons or as fuel for nuclear reactors.